Despite its sporty, Italian roots, at the heart of the 2015 Jeep Cherokee Trailhawk heart beats a family-friendly rock crawler. The rain fell down hard against the side of my head as I leaned out the window of the 2015 Jeep Cherokee Trailhawk. 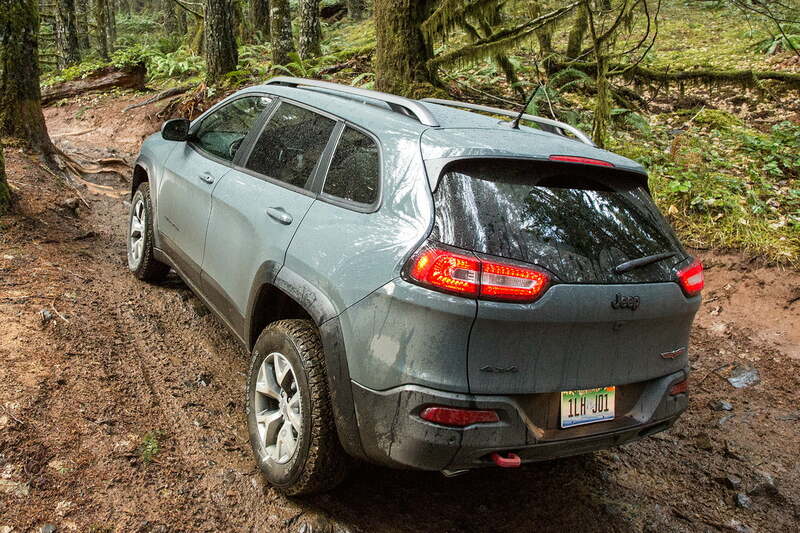 My co-pilot-turned spotter Peter Braun and I had taken the all-new Cherokee to Tillamook State Forest in the Cascade Mountain Range in Northwestern Oregon to test its on- and off-road capabilities. Nature did not agree with our plans. My soaking head was hanging out the window not for the fun of it, but rather because I was carefully watching the front fender as the Trailhawk inched passed an oft-gouged maple tree trunk to the left. I slowly let off the brake pedal and crept the mid-size Jeep back down the muddy, rutty trail. Just as its nose cleared the battle-scarred tree trunk, though, my view of the trail suddenly changed. “And now you’re on three wheels,” Peter relayed through the open passenger window. “Yeah, I know. 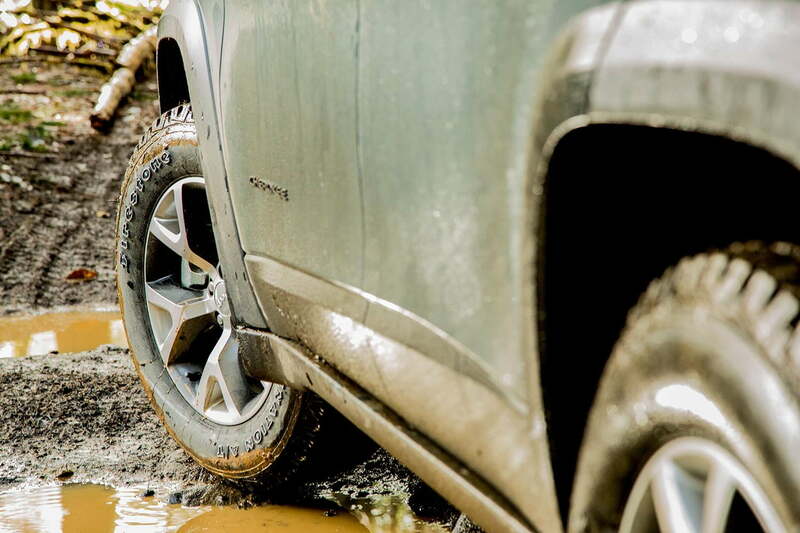 I could tell … but by how much?” I asked, as I stood on the Trailhawk’s brake pedal, holding the compact crossover in place — for fear of sliding uncontrollably down the path. “Oh great.” I replied with trepidation, gently lifting off the brake pedal and easing the Jeep back down the trail we had just confidently climbed. The right front wheel raised a few more inches before dropping back down into the muck as the left finally crested a large rock it had been climbing in reverse. With Peter’s help, I reversed the Cherokee Trailhawk back down the treacherous trail and back to the logging road off of which it had split. Without a doubt, the crossover could have gone further up the trail … we just didn’t know if we could. We quickly found that the rig’s capabilities easily surpassed both the treachery of Browns Camp and our nerves and off-road driving skill. This isn’t the whole Cherokee story, thankfully. Although its heart beats for the open trail, it’s much more than a rock-climber. 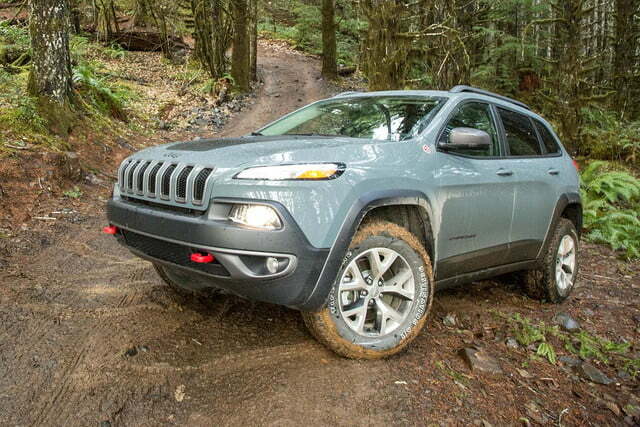 In fact, the 2015 Jeep Cherokee Trailhawk might be the best crossover I’ve ever driven. 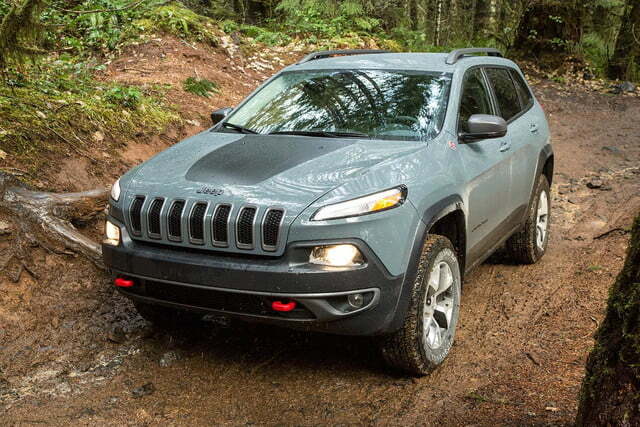 For a quick recap, this fifth-generation Cherokee (yes, Jeep fanatics, it is the fifth; the Liberty was a Cherokee in other global markets) is based upon a FIAT Group platform shared by the Alfa Romeo Giulietta, Dodge Dart, and new Chrysler 200. This makes it a car-based crossover. 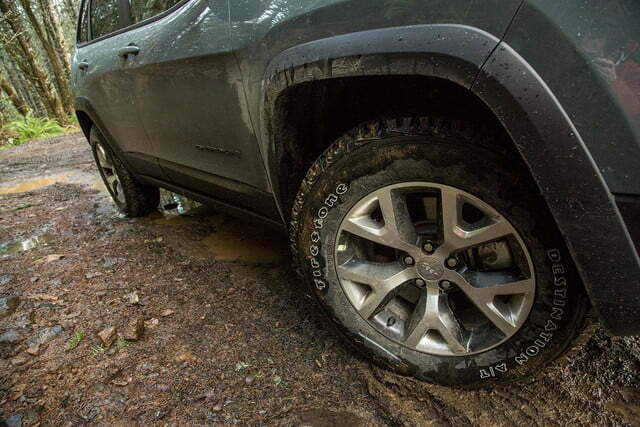 Although its heart beats for the open trail, the Jeep Cherokee is much more than a rock-climber. 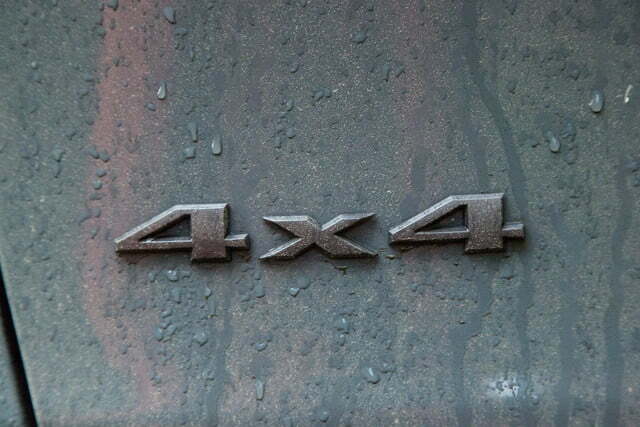 This is only really of note for one big reason: Though more livable and efficient than ladder-frame, truck-based 4×4s, crossovers are widely understood to be less capable off road … but we’ll get to that in a bit. The 2015 Cherokee — code-named “KL” — is powered by a choice of two engines: the 2.4-liter Tigershark inline four-cylinder or a 3.2-liter Pentastar V6. The Tigershark is rated to produce 184 horsepower and 171 pound-feet of torque. The Pentastar, however, which powered my Trailhawk test vehicle, is rated at 271 ponies and 239 lb-ft.
Tigershark is estimated by the EPA to achieve anywhere from 19 to 22 mpg in the city and between 25 and 31 mpg on the highway, dependent on which 4×4 level buyers choose. The Pentastar, however, is rated to achieve between 18 to 19 city and 25 to 28 highway — again, dependent on 4×4 kit. No matter the engine option, however, Jeep pairs the gasoline burners with its new nine-speed automatic, which also routes power either to the front wheels (4×2) or to all four (4×4). 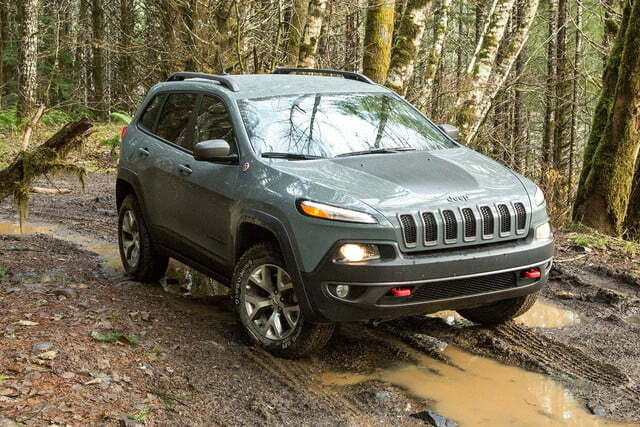 If buyers decide they want a 4×4 Cherokee, they have more choosing to do, as Jeep offers three — count ’em, three — four-wheel-drive systems: Jeep Active Drive I, Jeep Active Drive II, and Jeep Active Drive Lock. JADI is the simplest all-wheel drive system with only one operation: on or off. Like all the other 4×4 models, JADI operates primarily in front-wheel drive mode, disconnecting the rear axle for improved efficiency. When the vehicle senses the need for all-wheel drive, it will seamlessly — and without driver intervention — engage the rear axle. JADII has a few more levels of 4×4 than JADI. When in 4-Low mode, the vehicle locks the front and rear drive shafts for low-speed power or towing. This mode also includes a gear ratio reduction for off-road crawling scenarios and a one-inch increase in ride height for improved clearance. Jeep calls the Trailhawk the most off-road capable vehicle in its segment, which might not surprise you. 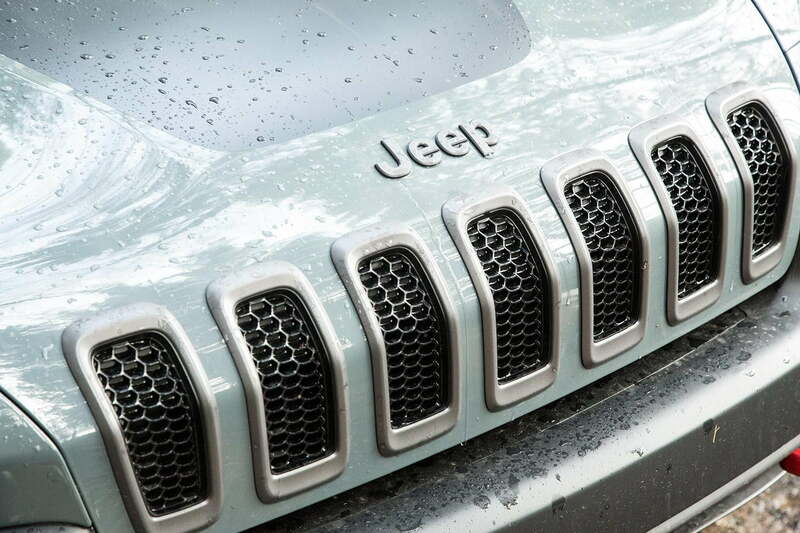 What might, however, is the fact that Jeep also says the Trailhawk is the most capable Cherokee ever. It easily mastered trails that I’ve personally seen highly modified, truck-based 4×4s struggle with. Looking at its standard spec sheet might well demonstrate why. Along with its matte-black hood accent and red tow hooks, the Trailhawk boasts many functional extras including a one-inch factory lift, the aforementioned Jeep Active Drive Lock with locking rear differential, and a set of skid plates. 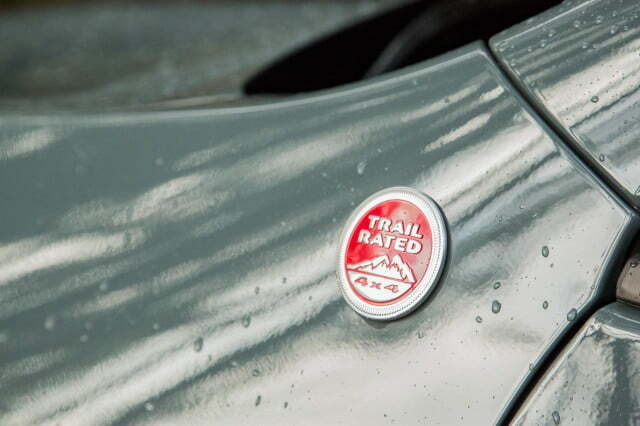 Why exactly did Peter and I feel compelled to challenge the Cherokee’s ‘Trail Rated” badge? 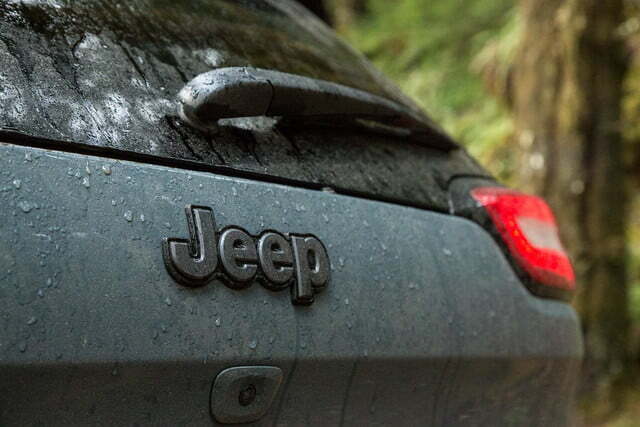 Jeep has staked its reputation on being both family and mud friendly. 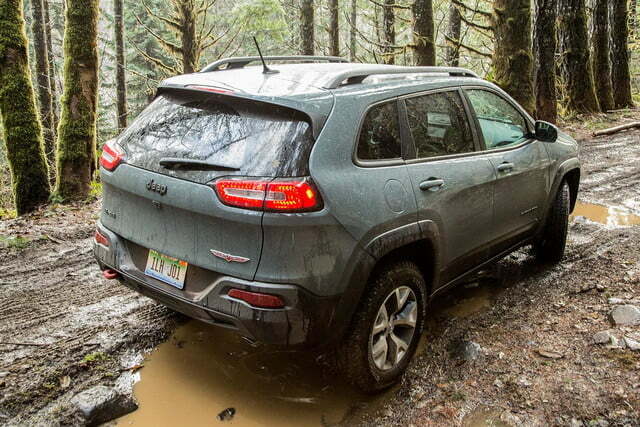 Simply driving the new Cherokee around urban and suburban Portland wouldn’t be enough to gauge the brand’s bona fides. Before we hit the trail, however, I stopped, put the nine-speed into neutral, and clicked the Selec-Terrain traction control system into Sand/Mud setting. Then I locked the rear axle with the Jeep Active Drive Lock and also engaged 4-Low. Setting off, the Trailhawk tackled with ease and confidence every obstacle we aimed it at. Ravines full of jagged rocks? No problem. 18-inch-high, mud-covered tree roots? You bet. Even larger and more sawtoothed boulders? Oh, were those even there? High-speed, rapid braking is hugely confident too — something usually and woefully lacking in most crossovers and SUVs. Amazingly, it easily mastered trails that I’ve personally seen highly modified, truck-based 4×4s struggle with — no small feat for a factory-fresh crossover. 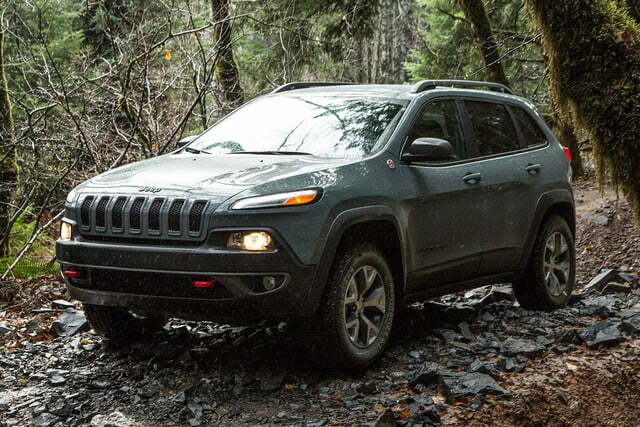 As good as the Cherokee Trailhawk is off-road, it’s even better on the road — and rightfully so. 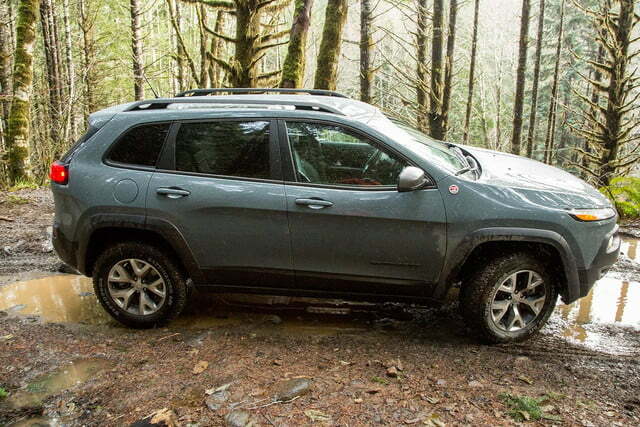 Jeep designers were able to mate the bossiness of the Grand Cherokee with the smaller Cherokee without faking the funk or losing the earned gravitas of the breed. The Trailhawk’s handling is sensational: Clearly, its suspension was tuned for the trail. On the highway, though, it shines equally brightly. High-speed cornering is met without any fuss or body roll. And potholes and speed bumps are absorbed with aplomb. High-speed, rapid braking is hugely confident too — something usually and woefully lacking in most crossovers and SUVs. And acceleration was excellent from the Pentastar V6; at full throttle, it gave a beefy roar. Under normal loads, though, its sounds were delightfully absent from the cabin. It’s not just the engine noises that are absent from the cabin; so too are wind and road noise. The Cherokee’s cabin is shockingly quiet, which is a nice accent to its incredible attention to detail and build quality. An example of the keenness with which the interior was designed is the center-top storage cubby. The Volkswagen Touareg features a similar cubby. It looks like an ugly afterthought, however, with weird gaps and an incongruent look. 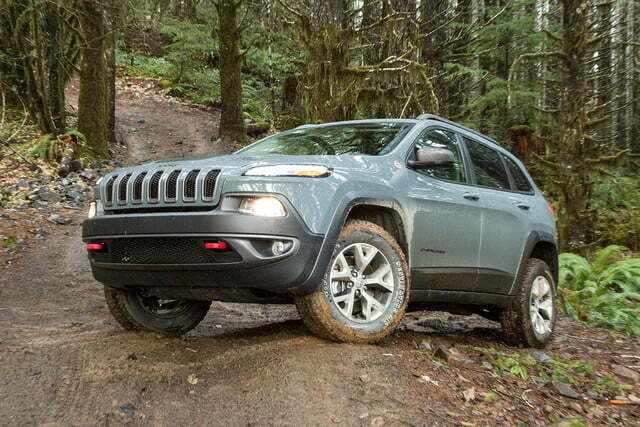 The one atop the Cherokee is a lesson in how to add utility without ruining an interior. The rest of the interior is also outstanding, with loads of leg and headroom for both rows of passengers. Although the load floor of the rear cargo area is rather high, which cuts into usable space, it’s accessed by an electric liftgate. With an access button next to the steering wheel and also on the key fob, drivers can begin the opening process before they’re standing behind the car (it is a bit slow to open, after all). When it comes down to it, the Cherokee Trailhawk delighted me at every turn — it’s truly a great vehicle. That isn’t to say it isn’t without faults, however. The industrial adhesives and such that make up the “new car smell” were so strong in the Cherokee that, while behind the wheel, I had the constant taste of having just licked an envelope, and often a pounding headache. Like all new car smells, toxic or otherwise, these will eventually fade. More substantively, though, the Trailhawk is rated at 18 mpg city, 25 highway, with a combined score of 20 mpg. During time with it I averaged 15.8 mpg during mixed driving, which isn’t very good at all when its competitors claim nearly double that. 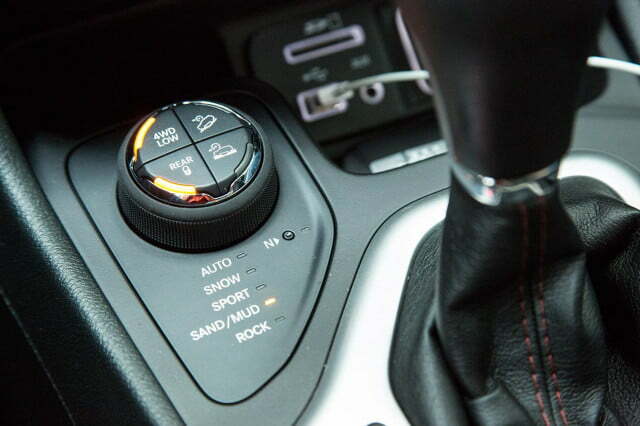 The biggest concern I have with the Cherokee comes in the form of its nine-speed automatic transmission. 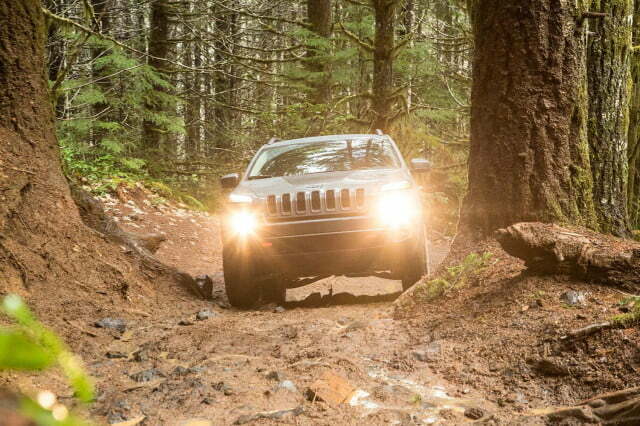 The biggest concern I have with the Cherokee comes in the form of its nine-speed automatic transmission. Yes, the unit shifts very well and offers seamless auto start stop at traffic lights, saving precious fuel. Anecdotally, however, it might be a reliability concern. 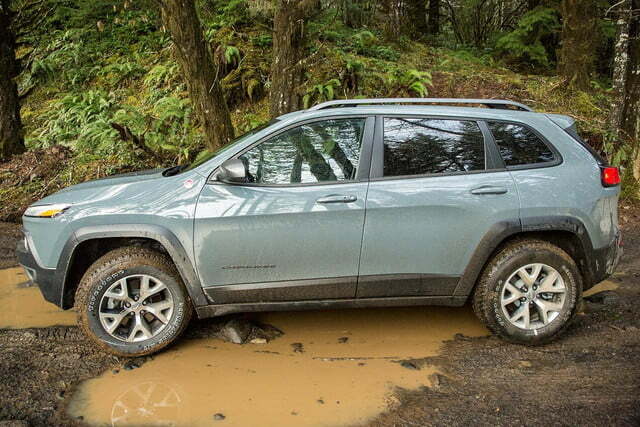 The first time Jeep put a Cherokee into the Portland fleet of press test vehicles, the car had to be sent back to Detroit when its transmission failed with around 1,500 miles on the odometer. Not long after that, the 2015 Chrysler 200 in the press fleet, which also shares the nine-speed, also had a major transmission failure and had to be trucked back to Detroit for a post-mortem. I can’t evaluate a car’s long-term reliability based upon my singular, anecdotal evidence. But the small pattern of transmission failure I’ve witnessed worries me. Heck, even the Acura TLX, which features the same nine-speed auto, is suffering from roll-away issues. If the prospect of the unknown frightens you, get the Honda CR-V instead. But I truly enjoyed the Cherokee and I recommend it. Buyers should fully understand that they’re buying a product with an all-new, unproven transmission, of course. And if you’re OK with that potential risk, you’ll love the heck out of your Cherokee.